i managed to get reshade loading again by placing the files inside the bin directory, however it seems to mess with the UI, as in the UI no longer loads, but reshade does load.. still trying to find out what is happening. They changed the Fivem UI in some way, and that seems to have affected reshade, and the way its loaded. but again, placing the reshade.ini and dxgi in the /bin folder in fivem application data will get it loaded again. Bear in mind i am using the latest 4.0.1 version. so maybe an older version still works, gonna try that now and reply here. using version 3.4.1.350 that i got from another installation i have yet to update does not work at all regardless of where i place it. so seems Fivem did something to prevent dll loading, and i might just be lucky to have 4.0.1 loading at all, even if it messes with the UI so it fails to load. i have contacted Fivem to hear what they did, and i am trying all the different settings i can tweak in reshade.ini, but so far no luck. I contacted fivem and they have told me that reshade did something to it. I still think it might be something they did.. As older versions do not work anymore as far as I can test. It just odd, that now with the latest it loads, but the UI fails to load with it. But if I disable it, it works fine. Reshade cannot auto update, so an older version of Reshade should work just fine, as I had an older version of Reshade installed, but it suddenly stopped working. And again, now only the latest will work, but it makes fivem not work. Maybe I can bypass the UI, as i only play on one server, but what about other people? Who play on more than one? okay, after some contact with the guys on the fivem forum, it seems reshade hooks onto somthing its not supposed to, which causes it to stop loading because it detecs something is wrong.. now to investigate how i can get it to not load on the main menu, so i can get it working again. Hiya! I'm one of the guys from the FiveM forums (the starter of the ReShade thread: forum.fivem.net/t/reshade-broken-in-latest-update/181984). The problem is that ReShade is hooking onto the 'FiveM_ChromeBrowser' process. When it does that, it prevents any UI elements from displaying. MrJeeves, yes thank you, we found that out rather quickly, now we are trying to get it to NOT hook onto that, or possibly delay the load of reshade, but so far no luck from me..
Really hoping they get this fixed, or at least find a fix. A lot of people use ReShade for FiveM. Yep... GTA looks trash without it! Before I installed FiveM the first time I did try and attempt to install it under the program files (x86) and non x86, giving it higher permission elevation before I resorted to installing it just under my C/ drive. Last Edit: 4 months 3 weeks ago by Term. 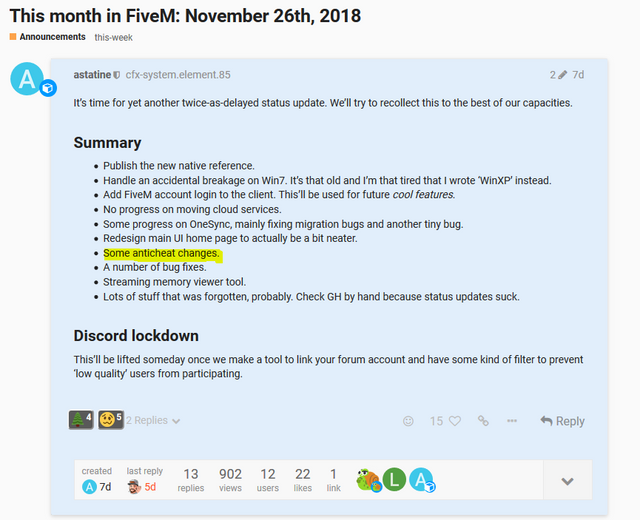 yeah this seems to be an issue that FiveMs new update has blocked, even though they said they haven't blocked ReShade from working, or done anything to make it stop working, it appears they made "anticheat changes" which likely are the cause of ReShade not working. Any updates on this? Anyone get it to work reliably and not screw with the UI? 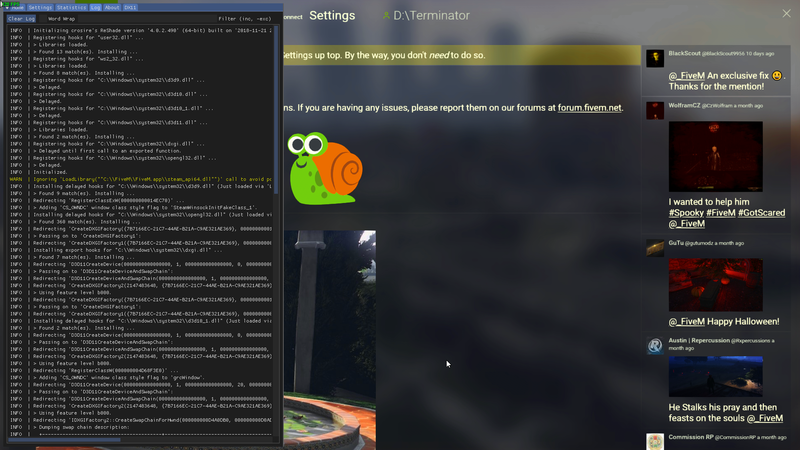 Install the reshade for regular GTA 5, then just rename the dxgi file to d3d10! Done!